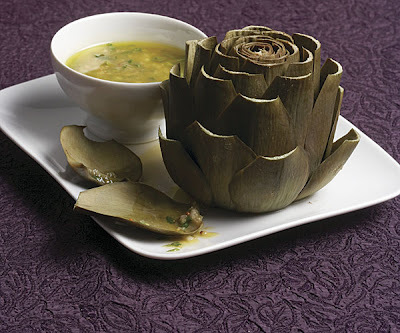 If you have never eaten Globe artichoke then you are really missing out on a taste sensation. For centuries the artichoke has been the domain of both Kings and the aristocracy - and even today, it is still considered to be very much the gourmet’s choice. However the problem with the artichoke is that it is not obvious to the casual bystander what you should do in order to prepare it. Worst still, without a passing familiarity to its flavour or texture, who in their right mind would invest the time and effort into a creating a dish that contained the artichoke as the main ingredient. To begin with, cut off the stalks of the artichokes and remove any hard outer leaves. Cut the lemon in half and rub the exposed flesh over each artichoke. Squeeze the remaining lemon juice into a pan of rapidly boiling, salted water. Plunge the artichokes into the water and boil uncovered for 25 to 30 minutes, until the outer leaves are easily detached. While the artichokes are cooking, make the vinaigrette. Combine the vinegar and mustard by placing them in a small container that has a detachable sealed lid. Now carefully add the salt and freshly ground pepper to your preferred taste. Next, pour in the olive oil into the container before securing the lid, then shake the mixture vigorously to make a thick dressing. Taste check it first before adding any more mustard, vinegar or seasoning - this dressing will keep fresh in the fridge for several days. Once the artichokes have finished cooking, drain off the water, then carefully – because they will be very hot - turn the artichokes upside down and squeeze out most of the remaining water. Using a sharp knife, remove the top half of the artichoke. Peel off the rest of the leaves and then remove the 'hairy' choke. Take out the hearts carefully using a spoon, and serve immediately with the vinaigrette dressing. Enjoy! Note. It is worth keeping the leaves as they contain a delicious and succulent base. Dip the base of the leave in the dressing then draw through your teeth to remove this tasty morsel. 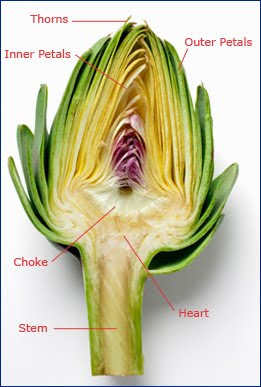 WHICH PART OF AN ARTICHOKE DO YOU EAT?